Zhang Yimou’s third martial arthouse adventure is less action oriented than the co-writer and director’s last, House of Flying Daggers, but even more ravishing in visual terms than his first stab at the genre, Hero. At heart Curse of the Golden Flower is an intimate chamber piece that dramatises the end of the flamboyant but decaying 1000-year-old feudal Tang dynasty, as represented by the patriarchal Emperor (Chow Yun Fat) and his subjugated Empress (Yimou’s former muse Gong Li, here working with her mentor for the first time since 1995’s Shanghai Triad) and their three varying loyal and wayward sons. Yimou periodically punctuates the domestic drama with a series of stunningly realised outdoors combat set pieces that serve to underscore what’s going on behind the walls of the Imperial Palace. During the grandest set-piece, for example, thousands of yellow armour-clad warriors invade the city and attempt to stage a coup d’état on the eve of the golden flower festival, while, inside, the Emperor’s increasingly brutal efforts to maintain order in his household begin to crumble as his wife and her favourite son rebel against his iron rule. 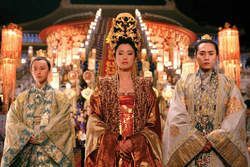 The ruination of the Imperial family is also juxtaposed with the film’s sumptuous period design - in which everyone and everything is draped in gold and jade - signifying the upkeep of deceitful appearances in the face of moral bankruptcy. It’s the stuff of Shakespeare, and at least three of the Bard’s plays - King Lear, Hamlet and Macbeth - are invoked as entropy unravels the Tang dynasty. Curse of the Golden Flower may not impress chop socky fans in the same way that Hero and Flying Daggers did, but the literary core makes it a richer emotional experience. General release from Fri 13 Apr.